Tubing is 1″ diameter (Ø25) x 20 gauge with a satin finish. Length will be as specified. Select rod length in inches (e.g. 048, 060, 120) to create Part Spec Order Number (i.e. 1214-060). Rod is held captive by flanges when installed properly. Rod may rotate in flanges if turned by hand. 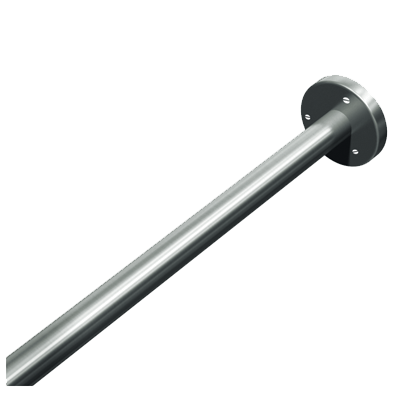 Correctly installed rod and flanges will support specified shower curtain(s) hung on hooks 1200-SHU or others (by others). Rod will bend and pull from flanges if significant body weight is suspended.